Previously in the Exploring Meghalaya series, I had written about Root bridges of Meghalaya in 1st part and Waterfalls of Meghalaya in the 2nd part. 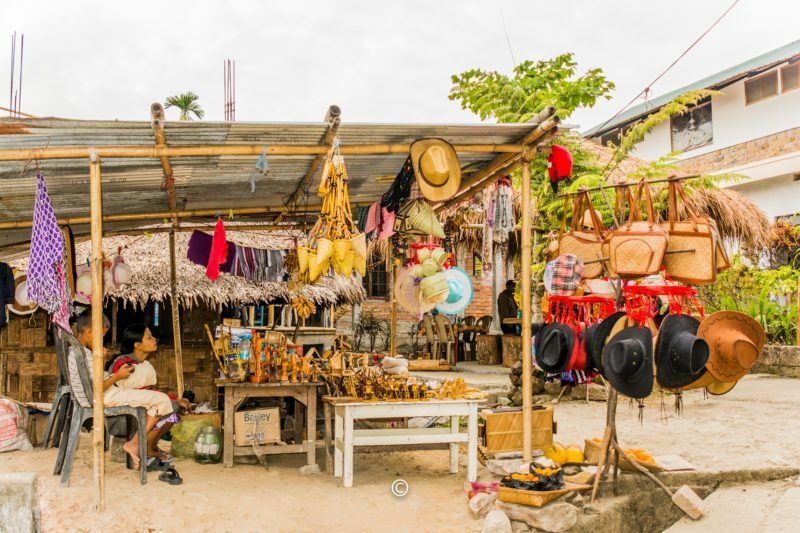 Continuing with the series, in this 3rd part of the series, I will be writing my experiences about Mawlynnong village and Dawki town. 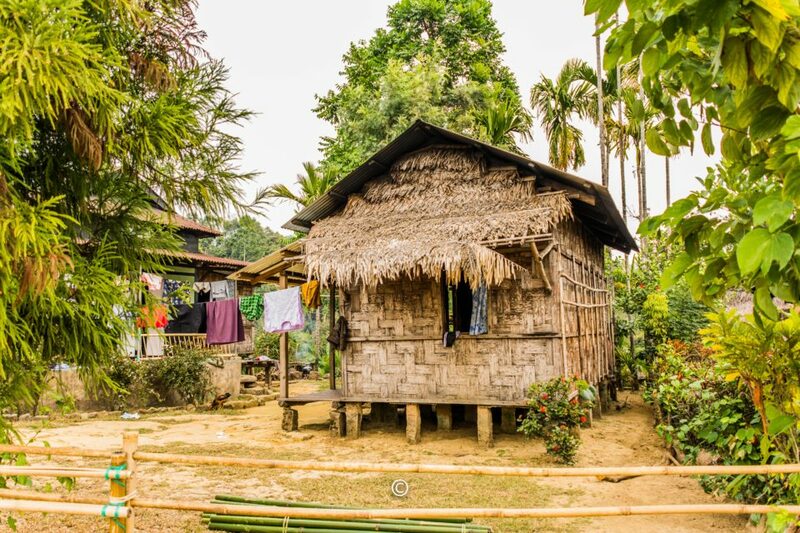 Mawlynnong otherwise known as Asia’s cleanest village, a crown worth its weight in gold. Mawlynnong is a sleepy little village in East Khasi hills district. 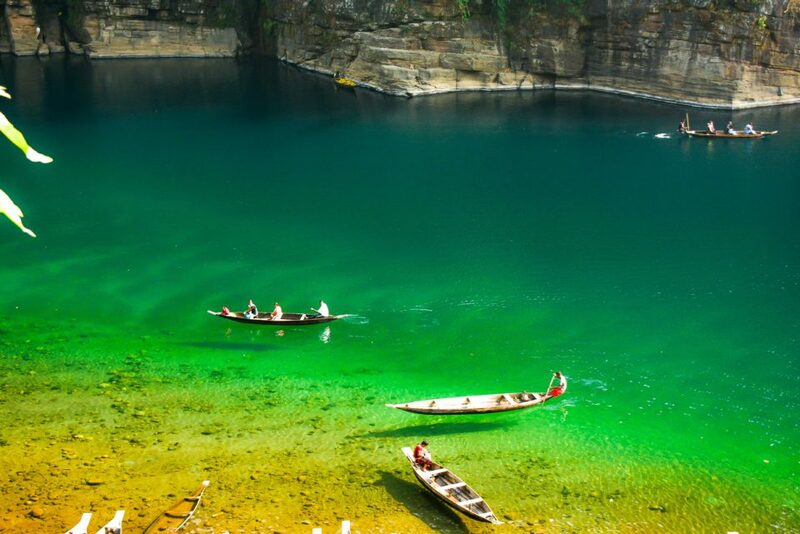 Dawki is the last point between Meghalaya and Bangladesh. The Umngot river flows through this town assuming some unearthly beauty, which is the main attraction in this town. 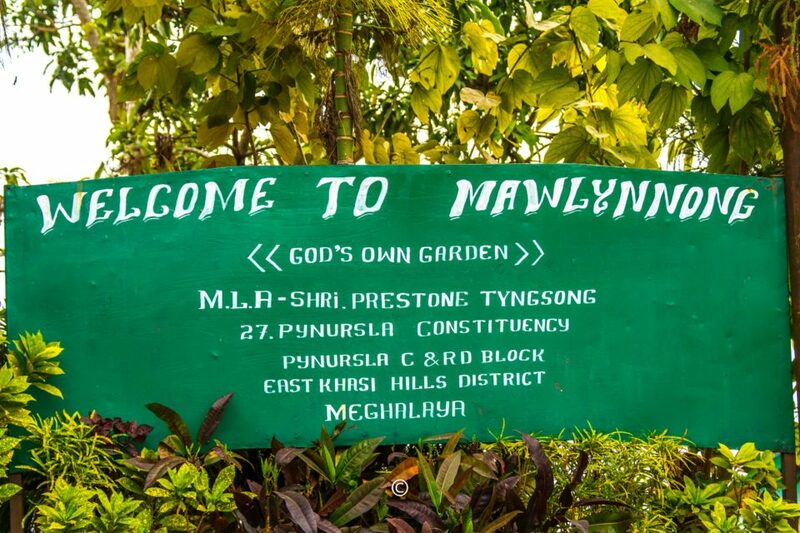 Mawlynnong – People take pride in calling the village God’s own Garden. We had seen the Root Bridges and Waterfalls staying in Cherrapunji. We decided to travel from Cherrapunji to Dawki town and stop by Mawlynnong village. Mawlynnong has been in the news since early 2000s as the cleanest village in Asia especially in 2005 by Discover India magazine. This piqued my interest in visiting this village. The Indian Prime Minister, Sri Narendra Modi, in Mann Ki Baat address in 2016, mentioned about this village. So we stopped by the village on our way to Dawki. We walked around the tiny village appreciating the calmness around us and amazed at the people’s determination to keep their village clean. We did not find garbage strewn around anywhere. Small pathways created to walk around and thatched homes dot the entire place. 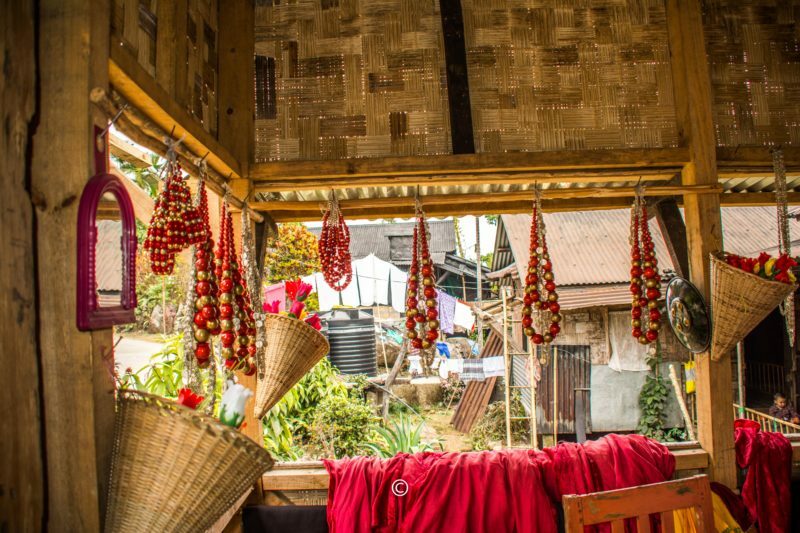 There were stores catering to the tourists selling handicrafts made by Khasi people, one of the major tribes in Meghalaya. 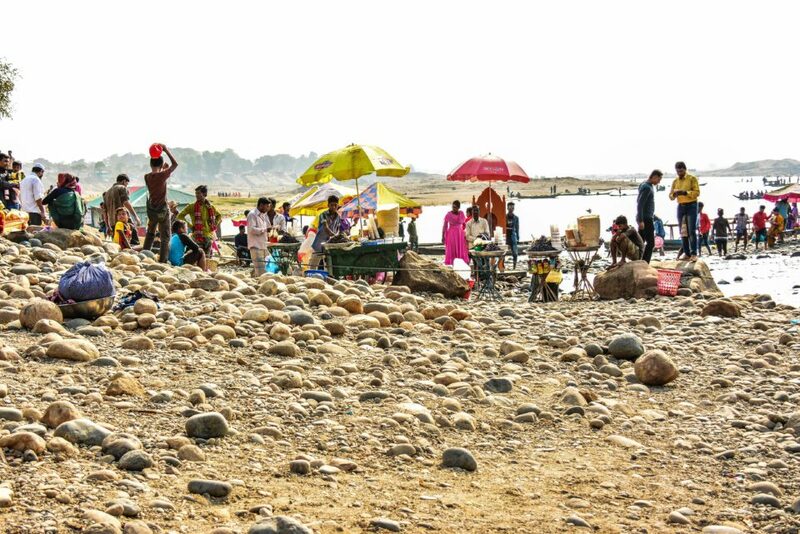 With nothing much to do beyond walking around the village and no one to talk to as the girls in the shops were busy with the tourists, we decided to head for Dawki. The drive to Dawki was one of the most splendid drives we had taken. The winding roads hugging the mountainside makes for breathtaking views. We did not get many chances to stop and take photos as we wanted to get to Dawki before noon. Nestled in the mountains and in plain sight is the jaw-dropping Dawki. Dawki is about a 85 kms from Shillong. This picturesque place simply lights up beautifully on a sunny day. The river running down into Bangladesh is like a beautiful moving mosaic print. 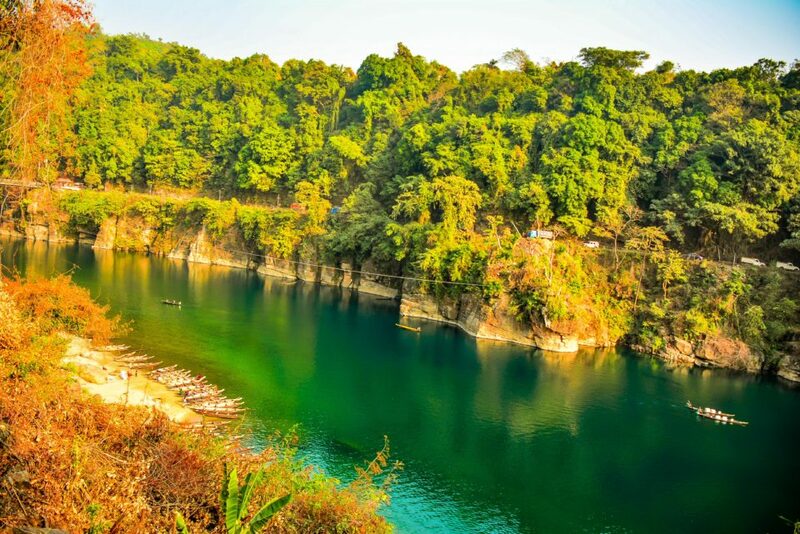 The stunning Umngot river flows down into Bangladesh , separating the East Khasi Hills District from Jaintia Hills District. On a clear sunny day you can see the bottom of the river. The pristine jeweled green waters give wonderful illusions of boats levitating on air. Levitating boats at crystal clear Umngot river on a sunny day. It is near the border of India/Bangladesh. India Bangladesh border in Dawki. The rope seen here separates the 2 countries. The river border is very porus and our men in uniforms (BSF) guard this rope delineated border on the river. You will constantly hear them make announcements over the microphone. Once we got there we walked upto the officer and asked him “Sir, how far can we walk along the river side?” BSF officer very curtly “Nowhere ma’am, you can not walk this way at all, you see the blue rope over there?” Me “yes sir”. Officer, “that is the Indo-Bangla border, you can walk this way as much as you want showing us the rocky side of the river”. We thanked him and walked away. We crossed the Dawki bridge on foot and went down to the other river side. This suspension bridge was built by the British in 1932 during their colonial rule over India. It now connects Dawki city to the National Highway. The bridge is always patrolled by the BSF and they keep the constant flow of trucks that wait to cross the borders from becoming unruly. They also help keep the traffic on the bridge under the required tonnage by stopping the traffic sometimes for 30 mins to an hour to keep the bridge always clear. We walked a bit and then took a boat ride around the river. The river looks beautiful only on India side as the river is flowing over rocks etc. once it reaches Bangladesh is hits the plains, making it a very plain river. Our cabbie had an interesting experience while we were exploring Dawki. Our cabbie took a boat ride and the boatman after dropping the cabbie at the riverside, gave the change in Bangladeshi Taka instead of Indian Rupees. Our cabbie asked the boatman to provide the change in Rupees and that is when the boatman told him that he was in Bangladesh and in Bangladesh he would not get Indian Rupees back. The cabbie was confused and to his horror, found out he was in Bangladesh and not India anymore. He practically ran to the border and told the BSF officer his story. Luckily he had his license and his ration card on him. The BSF officer verified his identity asked some pertinent questions and let him in after chiding him. The Borhill falls is right off of NH 206 while driving to Dawki from Mawlynnong Village. The water just gushes down the rocks. It is easily one of the most beautiful falls to stop by and enjoy the scenery around it. Something I would add here – we made 2 trips to Dawki. The first time we went to Dawki, we were greeted by heavily cloudy weather.We decided to come back next day. A tip for anyone going to Dawki, check if it is a clear day before you travel to Dawki.